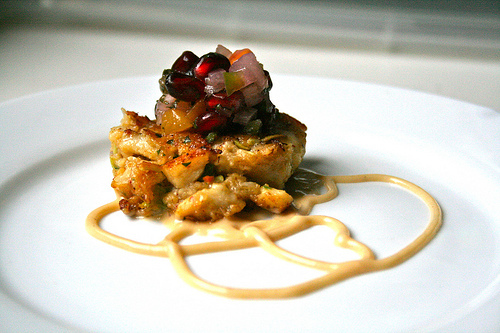 Nov 17 fish cakes... with chipolte aioli & pomegranate corn relish. I bought too much tilapia the other day, and made fish for dinner, then fish tacos and finally: fish cakes. We fell in love with the fish cakes. 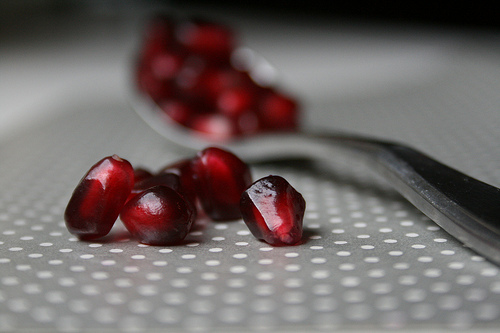 So much so, that they made my all-pomegranate 'Girls Night In' dinner menu. I served them with chipolte aioli and pomegranate corn relish. 3 cups tilapia or other white fish, roughly chopped 2 cups bread crumbs 1/2 cup shredded Parmesan 1/4 cup red onion, minced 2 tsp dijon 1/2 cup chipolte mayonnaise 1/4 cup mayonnaise 1 T Worcestershire pinch chili pepper KS&CP TT (kosher salt and coarse pepper to taste) 2-3 eggs 2 T minced fresh Italian flat-leaf parsley 1 tsp baking powder optional: 5 cloves garlic optional: 1/4 cup minced annaheim pepper optional: 1/2 cup minced broccoli slaw (Trader Joe's). Put all ingredients in bowl, stir to combine, then form in patties. Freeze some for later, if desired. Cut up red onion and place in cold ice water for 20 minutes; drain and squeeze to extract excess water (use paper towels). Combine remaining ingredients. Store in fridge until ready to serve (I usually make it in advance, to let the flavors mingle. Then let it sit at room temp prior to service). Oct 22 FIVE FABULOUS, easy-to-make sauces that will ROCK your daily taco.